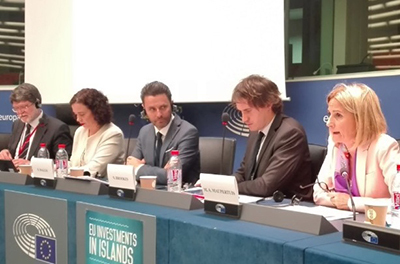 The voices of CPMR island regions were heard loud and clear at a high-level event on European Investments in Islands, organised in Strasbourg on 18 May 2017 by the Seas, Rivers, Islands and Coastal Areas (SEARICA) Intergroup. The representatives from the CPMR’s member regions, namely Marie-Antoinette Maupertuis from Corsica region and Felix Pablo Pindado from the Government of Illes Balears, expressed the difficulties of islands regions to access EFSI financing. They advocated for the genuine implementation of the specific provisions towards islands already existing in EU regulations, so that they can fully benefit from EU investment policies, and called for a strong Cohesion Policy for the post-2020 period. Gerassimos Thomas, Deputy Director-General of the Directorate General for Energy, stated that investment policies are the top priority of the Commission and stressed the need to create synergies between the European Fund for Strategic Investments (EFSI) and Cohesion policy. However, for José Manuel Fernandes, MEP and European Parliament Rapporteur for the Juncker Plan, this does not mean that the strategic role of Cohesion policy will be reduced in the future, but should rather be completed by this new instrument. Other messages echoed by both the CPMR and Members of the European Parliament included the need to reinforce the territorial dimension of EU policies and instruments, establish clear boundaries between the EFSI and Cohesion Policy and not impose compulsory use of financial instruments in the future.